Last night was Neil Young's annual benefit for the Bridge School. Though Eddie and Pearl Jam were not scheduled to appear, Eddie did hop on stage for a two song set prior to Guns 'N Roses. 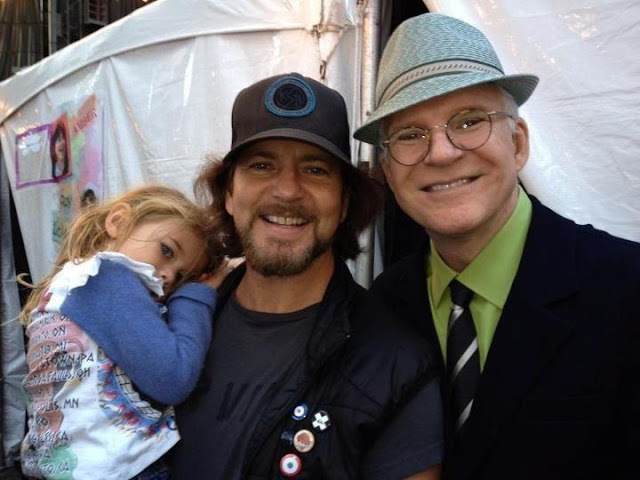 .... and he took a moment to pose with Steve Martin. If you'd like to see Eddie's set of Last Kiss and Elderly Woman, you can check it out on YouTube. And a special thanks to Gremmie. I pretty much just stole your Facebook page for this post.